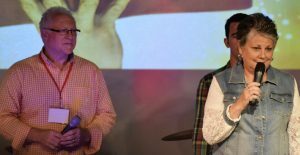 Ministry Leadership | Special Touch Ministry, Inc.
Missionaries Charlie & Debbie Chivers founded Special Touch Ministry in 1982 when they decided to dedicate their lives serving people with disabilities. From the National Office in Wisconsin, together with the board of directors and other executive leadership they direct and oversee the development and implementation of the many programs and services offered by Special Touch Ministry, Inc. Charlie is also responsible for overseeing national disability ministry for the Assemblies of God. They also co-coordinate the annual Wisconsin Summer Get Away. Joe and Ann Trementozzi have been involved in full-time missions work for over 15 years. As fully appointed U.S. Missionaries, they joined Special Touch in 2007. Through the prompting of the Holy Spirit and the birth of their daughter Beth Ann, who has special needs, their calling is to serve people with disabilities and their families with compassion and the love of Christ. In addition to administratively serving in the Summer Get Away, Chapter, and Missionary Associate programs, Joe and Ann also travel to local churches and other venues creating awareness of the need for people with disabilities and their families to become a vital part of church and society. Brad has been involved with Special Touch Ministry since 1982, where at the very first Summer Get Away, he sensed God calling him to help people understand the Bible. Matt was raised in a Christian home and always knew that God had a plan for ministry in his life. When he was 25, he felt God calling him to attend Southeastern University. There he received his degree in church leadership and ministry. When a missionary visiting his church spoke about the Special Touch Florida Summer Get Away, Matt felt that God wanted him to go and volunteer as a caregiver. That week not only touched his heart, it changed his life. After time spent connecting with the Special Touch Leadership, God finally opened the door, in 2012 for Matt to become a Missionary Associate. In the spring of 2012, Nilda became a Licensed Assemblies of God Minister. That fall, she took another huge step by joining the Special Touch Ministry Team on a Missions Trip to the Dominican Republic. The next summer, Nilda became a Missionary Associate. Nilda is an accomplished speaker and singer. She is actively involved with the Special Touch local Chapter ministry and hopes to continue traveling on missions trips and fulfilling her calling as God opens doors. Raised in Louisiana, Tom Maher left his traditional Catholic upbringing at 16 and began his “quest for God”, serving in many Louisiana churches. God continued to lead him on a journey that would take him to Nebraska and finally, to Wisconsin. In 2013 Tom realized that he was called toward serving as a Special Touch Missionary Associate. Tom and his wife Cindy have been married over 30 years. They have been a part of developing the current Summer Get Away Tech program, working with ministry leaders to enhance and strengthen this backbone of the Special Touch Summer Get Away program for the future. Mike and Kim have an enormous passion for serving people impacted by disability. This couple had been first affected by disability themselves when their son, Chris, was diagnosed with Asperger’s. In 2011, they began with Special Touch as volunteers at Special Touch North East Region Summer Get Away. The need for disability ministry became even more apparent to them when the son of a good friend was in an accident. They realized that the three greatest needs of people with disabilities were support, practical help, and a church family. Mike and Kim have been strong leaders with Special Touch. 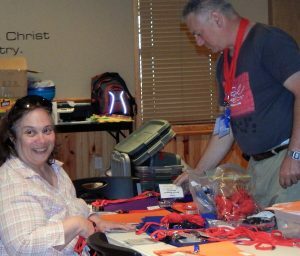 From running fundraisers and Chapters to coordinating a Summer Get Away, as Missionary Associates they intend to continue serving as needed to meet the ongoing needs of people impacted by disability. Lori was diagnosed with the same condition as her two older brothers, Spinal Muscular Atrophy, when she was a year and a half. She grew up surrounded by others who lived with disabilities and always had a soft spot for those less fortunate. Lori felt God had a call on her life from an early age. After an initial contact with Special Touch Ministry in the early 1980’s, she was reintroduced to the ministry by her fellow Chapter officer, Roger McCall, and attended her first Florida Summer Get Away. 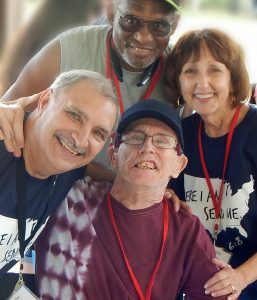 Since being involved in the local Special Touch Chapter and in various Summer Get Aways in Florida, North Carolina and Georgia, God has ignited a passion in Lori for reaching the community of individuals with disabilities for Christ. Her passion also encompasses helping the local church grasp the vastness of this mission field and the value of these individuals as members of the community of faith. As a Missionary Associate with Special Touch, Lori seeks to answer the call God placed on her heart. In college Tracie worked as a caregiver in a group home. Her supervisors knew that she was pursuing her teaching degree and asked if she would like to be an Adult Basic Education Teacher at their day programming center. After a few months, Tracie was asked to become the Director of the program. Eight years later, God directed her path back to education and she began teaching at Youngstown Christian School. Each year, Directors Charlie and Debbie Chivers visit many churches, challenging congregations to consider the spiritual needs of people with disabilities in their communities. In 2014, they spoke at the church where Tracie and her husband, Duane, attend. Their message resonated with Duane and Tracie who have a special place in their hearts for people with disabilities. That morning, Tracie sensed God calling her to be a part of this ministry. Along with serving as Missionary Associates, Duane and Tracie are now coordinating the Ohio Special Touch Summer Get Away. Growing up in Wisconsin, Todd accepted Christ as his personal savior through the Promise Keepers Men’s Ministries in Minneapolis, MN in 1995. In 2012, he began missions work, with trips to Mexico, Argentina, and Kenya. Over the years, Todd has also been involved in ministry to children and the elderly as well as serving for 15 years as a caregiver to people with disabilities at the New Hope Center. Joining Special Touch Ministry, Todd has served in multiple Summer Get Away and Chapter locations. Along with his new bride, Sylnoiva, they’d intend to continue helping people experience God’s love through salvation, healing and being a servant. Randy Anderson has been a strong part of the Special Touch Ministry tech team. He has a heart for serving people with disabilities in a supportive role and looks forward to the direction God is guiding him as a Missionary Associate with Special Touch. Rick Heitz was confronted by huge obstacles when he was diagnosed with an autoimmune disease called Sjogren’s, with symptoms similar to Multiple Sclerosis. He serves in some volunteer roles helping others who are impacted by disability to overcome their challenges. Rick’s passion is to help the church to become more involved in the lives of people with disabilities. Several years ago Lonnie & Janet felt God calling them to work with people with disabilities. Following this call led them through the Assembly of God leadership to Charlie Chivers and Special Touch Ministry where they officially came on board as Missionary Associates in 2018. Over 30 years of parenting a child with an intellectual disability has provided them with a large understanding of the uniqueness in serving this people group. They currently reside with their daughter, Beth, in Chadwick, Missouri. By combining passionate hearts and a lot of patience, their desire is to use their skills, talents, and even weaknesses to achieve the ministry goals God has for them. After a few years of volunteering with the Special Touch Florida Summer Get Away, God revealed to Charlene a way to continue serving, making a difference in the lives of families impacted by disability as a Special Touch Missionary Associate. Charlene lives with her family in North Eastern Florida. She is looking forward to being a part of the Special Touch Ministry Leadership where she can use her skills to not only speak the message of our Lord and Savior into of lives of others but also continue making lifelong friendships.